Keeping the inside of your house clean is simple enough with various cleaning equipment, but the real challenge comes when there is dirt, grime, muck or mold that needs to be taken care of. With a proper set of tools that come with Ryobi pressure washers, hard work can turn into a fun outdoor activity. Ryobi is a well-known brand, so we selected 3 of the most popular models to analyze and test in the field. Choosing the right pressure washer can be tricky because there are so many things you need to consider before buying. However, with Ryobi pressure washer reviews we’ve prepared, it will be easy to pick the right cleaning unit. It’s a surprisingly strong unit, considering the fact that it’s electric and not a gas-powered pressure washer. With its 2000 PSI, a 13-amp electric motor, and 1.2 GPM, this power washer can perform light to medium residential cleaning. The total cleaning power score is 2400. This robust-looking Ryobi pressure washer is surprisingly lightweight for its size – in only has 32 pounds. The electric engine is neatly surrounded by the durable metal frame which provides a great level of protection. On top of its body, there is a foam-coated handle and a hose reel. When not in use, this power washer can be packed tightly, saving storage space in the process. Underneath the body, there are two convenient wheels for easier transport. This model comes with a 25 feet-long non-marring, high-pressure hose and 3 different Quick-connect nozzles (15-degree, soap and the turbo nozzle). The manufacturer guarantees that the turbo nozzle can enhance the quality of washing by up to 50%. This model is slightly less powerful, but it’s packed in a compact and easily transported frame, weighing only 19.2 pounds. The Ryobi 1600 has a 13-amp electric motor that can generate around 1600 PSI at 1.2 GPM. The total cleaning power score of this unit is 1920. This is enough for occasional light cleaning around the house. Ryobi comes with 3 Quick-connect nozzles (15-degree, soap and the turbo nozzle), and it also has a 25 feet-long pressure hose. If you decide to go with a soap dispenser nozzle for the task at hand, this unit comes with a 0.25-gallon detergent tank on board. The housing of this model makes a huge difference. The manufacturer chose not to put wheels, so you have to pick it up and carry it around. After all, this is a small and compact, easily transported unit with optimum weight. 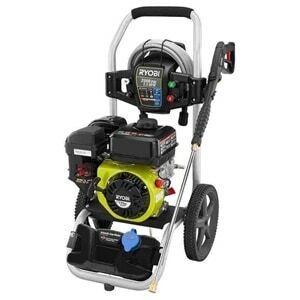 Even though there are no wheels, this pressure washer has a quality, full frame metal housing with a handle on top. Also, this design provides a protective case for the electric motor. Even though this model is not made for the hardest of challenges, it can certainly prove useful for light cleaning. You can use it on patios, garden furniture, light car washing, window washing, and such simple tasks. 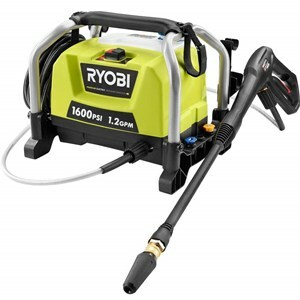 Last but definitely not the least, is a Ryobi pressure washer that lets you do both medium and heavy cleaning. 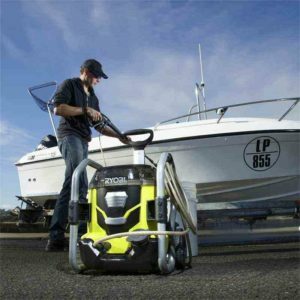 This Ryobi 2800 comes with a powerful Honda GCV160 gasoline engine which outputs a washing power of up to 2800 PSI at 2.3 GPM. The total cleaning score for this unit is 6440. More pressure washing power also means more weight – the model weighs a total of 62 pounds. This power washer also has a 25 feet-long high-pressure hose that can be put away when not in use. Speaking of equipment, Ryobi also comes with 4 Quick-connect nozzles (0-degree, 25-degree, 40-degree and the soap dispenser). There is a detergent tank attached to the bottom side. The motor is mounted on top of a metal frame, easily transported by two big wheels. This model has a built-in power control regulator, so you can lower the output for a more sensitive surface cleaning, or if you want to turn it up to the max and defeat the heavy stains. Ryobi is a company made of so-called `DIY-ers`, people who are enthusiasts in tinkering, enhancing and making various things. They are proud to develop tools for working around the house, and for inventing new systems and technologies. One could say that crafting is their art and that achieving the best results depends on obtaining good tools. They are not shy about it either. Their Ryobi Nation is a type of social network that rallies all these enthusiasts and enables them to compare their projects, or even help each other out. This kind of cooperation gives an added sense of security if you are new to using power tools. Nevertheless, the company has a standard business model that seems up-to-date with the current events in the tool world. However, Ryobi keeps an homage to their beginnings, since the company is founded in 1943, and their business approach portrays a perfect balance of both traditional and modern values. The company branched into three sectors: power tools, outdoor products, and landscaping machines. Each of these branches has a community filled with enthusiasts. This company also takes pride in supporting independent and small-time inventors and patent makers. This only means that Ryobi tries really hard to maintain the patron status for all hobbyists. If you are aiming for versatility, this company can offer you a wide choice in picking the right power range for the cleaning project you have in mind. They offer pressure washers that vary from handheld to raw-power gasoline ones. Additionally, there is the fact that Ryobi invested a lot of time in safety design, and they did a really good job when it comes to durability and ergonomics of storing pressure washers when they are not in use. This company also insist on the availability of spare parts, as they offer quick and effective support when it comes to getting the required parts for your pressure washer. If you have troubles deciding which one to buy, the rule of thumb is: electric ones are good for washing cars and porches, and gasoline-powered ones are perfect for paint stripping, washing the sidings, concrete driveways, and all rocky and marble surfaces. When it comes to problems regarding a piece of equipment, the Ryobi Nation social channel is a solid source of all additional info about your tools. This is a fairly rare support system that helps a lot, especially if you`re a beginner. Nevertheless, it is worth mentioning that their online services are solid and simple, and their website is browsed with ease. What makes things even better when it comes to learning about the products is the fact that the company offers How To videos, buying guides, DIY ideas and more. This can make your learning experience quicker and much more enjoyable. Not to mention the fact that sometimes even the most knowledgeable product users need to brush up on their skills. The company gives you a three-year warranty on the washers, and a separate 2-year warranty on engines if the washer you have chosen happens to be a gas-powered one. Many have reported that their customer service is quite responsive. When choosing a power washer, keep in mind that the strength and power of the washer you choose should depend on the scale of work you will perform. Even though a smaller unit is compact and comes with high mobility, sometimes you will need the big guns for heavy stains, and by that, we mean gasoline-powered pressure washers. To understand this sharp contrast in pressure washers world, you can start your research from our homepage. 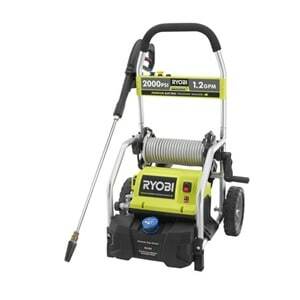 We have included the Ryobi pressure washer reviews and buying guide so you can choose the most suitable type of cleaning unit for your needs. All Ryobi pressure washers offer you solid versatility and power in this price range. As you have probably noticed, the company insists that you participate in the community and learn along the way. Their extremely beginner-friendly environment can be a great benefit if you are new to power tools and pressure washing. It is also important to remember that the warranty system is pretty fair, and any information about the washer you might potentially need is easily accessible. Essentially, Ryobi pressure washers can fulfill your cleaning needs and will teach you how to do it better along the way.